I have been teaching Nia in San Jose for four and a half years. 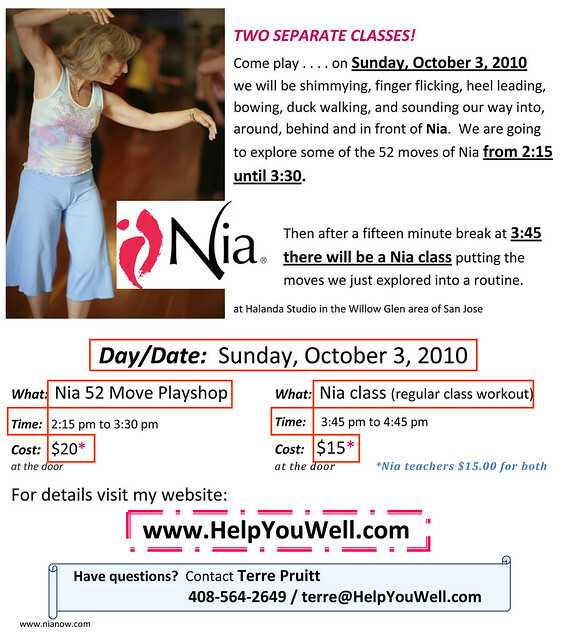 I have been teaching Nia in the same studio in Willow Glen. I drive down Lincoln about twice a week. There are many stores and businesses on the street. There are also many pedestrians. For those of you that don’t know, Lincoln Avenue is very pretty. They have trees and bushes and flowers . . . very nice landscaping, however, the lovely foliage HIDES the pedestrians and those flashing lights (the ones that flash to call attention to pedestrians crossing the street). So you have to really pay attention. Sometimes people just dart out from the bushes. I am always concentrating on the pedestrians so I don’t notice all the stores that come and go. When I do walk down the street I am always amazed at a new shop that has popped up or one that has closed. One of the new ones is Glow. 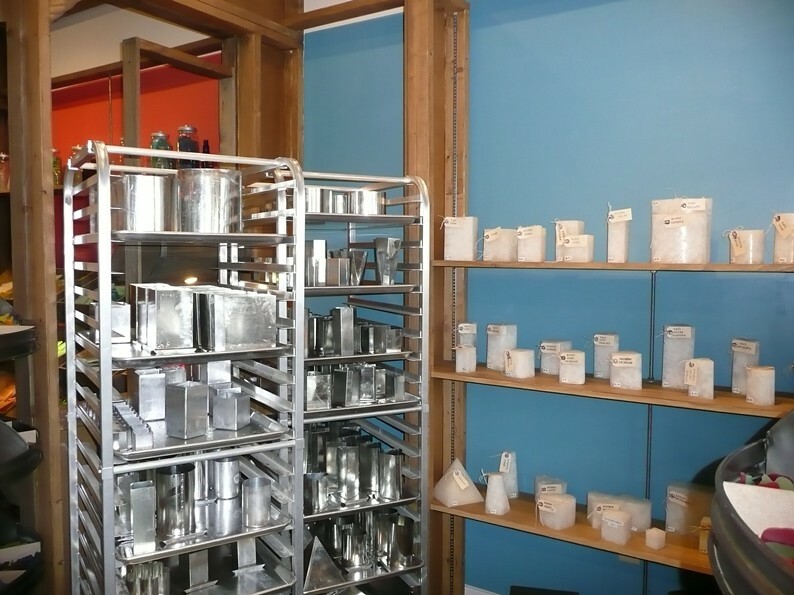 It is a build-a-candle candle shop. When I first saw it I was so excited. I kept squealing with each new thing I saw as I walked through. 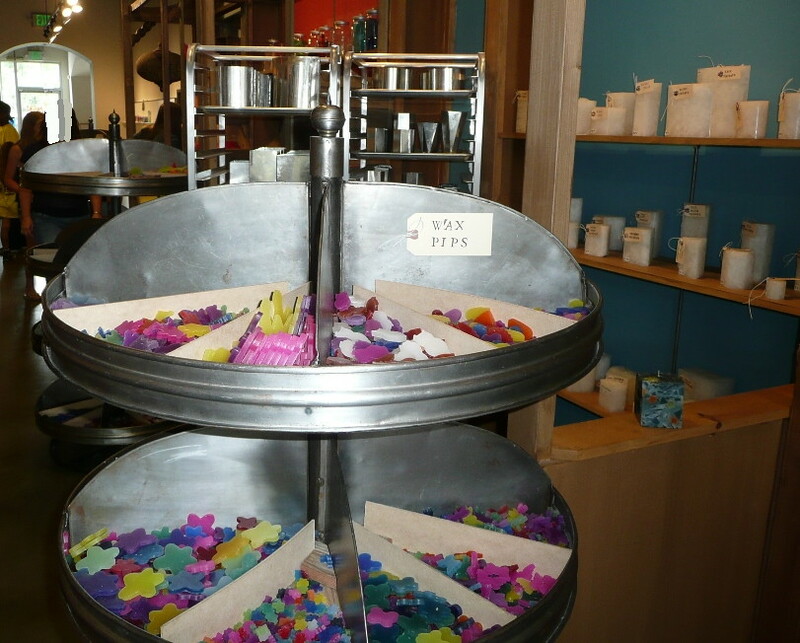 There are colors and fragrances and little trinkets you can add to the candle. I couldn’t wait to go! This week I have my niece visiting and I thought it would be fun for us to go make a candle. It is something we can do and visit at the same time. Plus it is creative and then we will have a candle to show for it. First you choose your mold. What size and shape you want. Then you choose your colors, any pips, and if you want any trinkets. Then you choose the scent you want to have. Then you set about putting it all together. 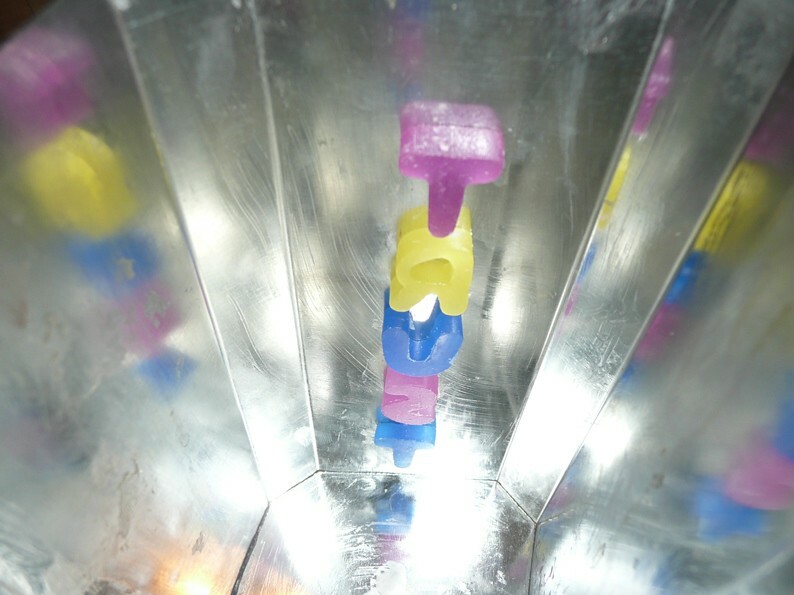 The pips are plastic pieces that you stick to the side of the mold. They have all different kinds of pips: butterflies, birds, flowers, stars, guitars, martini glasses, crosses, letters, lipstick, dresses, shoes, you name it, they probably have it. After you stick the pips to the side, then you break up the sheets of wax. You get to choose from a variety of colors. Once the candle is poured and set, the pips show through on the sides of the candle. When you are done filling the mold with the pieces the shop keep pours hot melted wax into the mold over the broken pieces. Then it sets. The store keep puts a wick in it and polishes it and you have a cool candle that you made. There is “studio fee” of $9.95 and then the cost of the candle which is determined by the size and shape you choose. 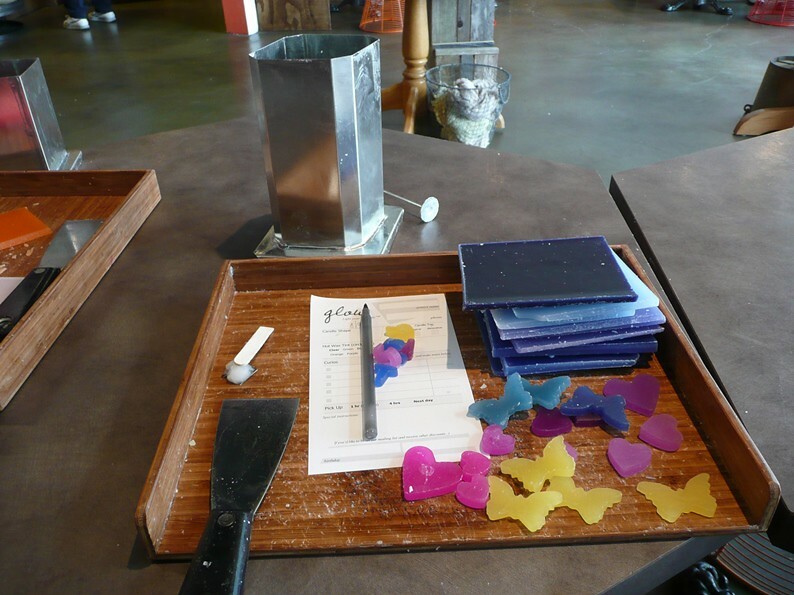 All pips are included as well as the poured wax and fragrance. The little charms and other things are priced per piece and the costs vary from less than a dollar all the way to at least $4.00. I believe there might be ones that cost more than $4.00 but that was the one I saw. The day we went back to pick up our candle we were being helped by the assistant manager, Laura, and she was a wealth of information. She shared some tips and tricks that my niece and I wished we had been privy to the day before when we were making our candles. But now we know and we are anxious to go back again to make more candles. The experience is not an inexpensive one, but as I said, it is an EXPERIENCE. It is an activity. It is a fun thing to do with people who you want to be with. Once you pay the studio fee you can buy as many candles as you want to make. So it could be a great way to kick out some gifts for Christmas. Pay the studio fee then make a few candles. Do it with friends and you have a great time. I think an activity that results in a wonderful smelling candle makes for a great day. My niece and I had a great time. I thought it was great fun to build a candle. I also thought is was pretty exciting to wait for the candle to be ready for pick up the next day. 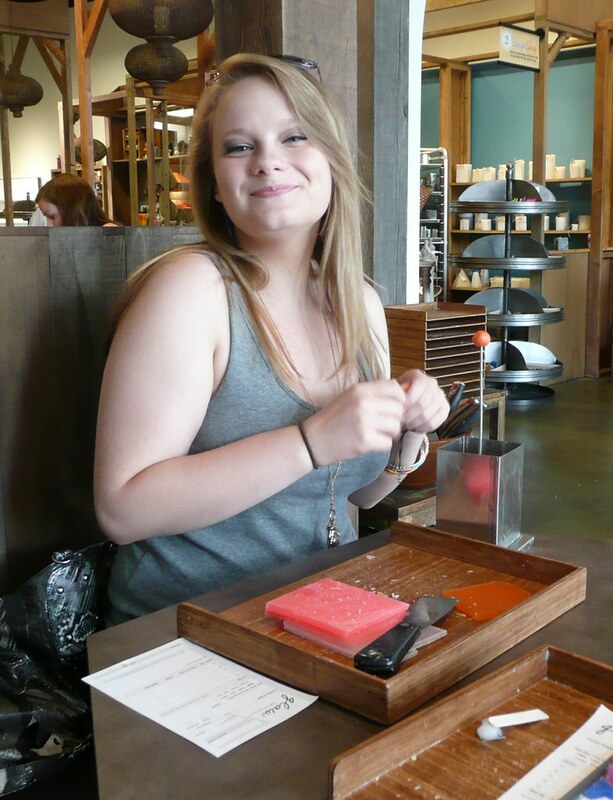 I really love this activity and can’t wait to go back. 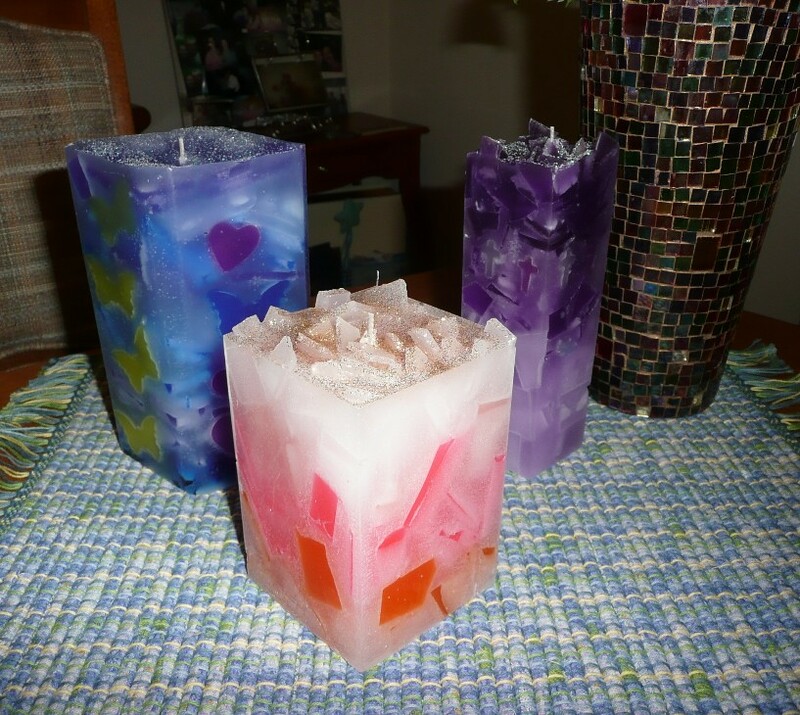 The candles we made, while not perfect, look pretty nice, smell great, and burn well. This was definitely a fun time with wax. Do you like candles? What color candle would you make? I have heard many people use it. Recently I was having coffee in Willow Glen and I overheard someone say they were bad for eating something. Or sometimes we say we are eating something bad. For example, “I was bad because I ate four pieces of pizza.” or “I ordered a sandwich and was bad because I got fries.” The use of the word bad gets no reaction. Most of us just shrug and say nothing. Some people even like it when you are bad. Some people even think bad is good. So it really doesn’t have an impact. It really doesn’t matter. Think about it? Is there something you ate today, that you would consider “bad”? Or HOW MUCH you ate, would you consider it bad? If there is, try this exercise, say it out loud. “I was bad because I ate a half dozen cookies.” “I was bad because I ate my chips with my sandwich.” Or whatever . . . . just say it out loud. What if instead of saying “bad” we identified it a little more clearly? What if instead of saying “bad” we said “unhealthy”? I keep hear “health” lately, so what if we actually said, “unhealthy”? Do you think that would make a difference? Do you think if we actually used a word that is a little more clear and can actually be associated with a huge topic right now, that we might actually NOT eat that unhealthy food item or that extra unhealthy portion? Do you think people might actually pause and think, “Yeah, that is unhealthy, maybe I won’t.” Instead of giggling because you were “bad”? Now instead of saying “bad” as you did previously, say, “unhealthy“. “I was unhealthy because I ate a half dozen cookies.” “I was unhealthy because I ate my chips with my sandwich.” If we start saying it differently do you think we might start eating differently? Maybe the same can go for working out. Haven’t you heard someone say, “I was bad because I didn’t workout.” What if we started saying, “I was unhealthy today, because I didn’t workout.” I’m just wondering if changing how we say it might help us change and care about our health. So, I could just fill my blog with Nia, but I want to post other stuff too because I am interested in other workouts and exercises and I like to share other stuff. Today is supposed to be my “fun” post or “whatever” post, not necessary related to health, wellness, or Nia™. I thought that I would find some inspiration before the day was out, but . . . nothing. So . . . here I am, back at Nia and the wonders of it. I left an article from Nia Education in the studio where I teach (in Willow Glen) and it is about sounding. This evening (when does “evening” start? Anyway . . .) when I was explaining to my class in Los Gatos that Nia uses a focus it dawned on me that I didn’t have a focus for class. Then it came to me in a flash “Sounding”. Nia calls it sounding, I’ve heard some classes call it vocalization. Whatever . . .
We had a few songs that were great for sounding and that are normally done with us making noise, but tonight I added noise (sounding) into all of the songs. I am going to be honest, when I am TAKING a Nia class I am not a big “sounder”, I am getting better, but I don’t always do it. So I know how intimidating it can be. And it frustrates me (that I don’t do it) because I know—-I have FELT the benefits. When I first started doing Nia I didn’t make any sound. Then I was in a class and I realized that I was the only one NOT making sound so I joined in—-HOLY MOLY! What a difference that makes. It is amazing and I can’t really describe it. But because I have felt the benefits, I am getting better at doing it in other’s classes, and I do it when I am leading my class. Tonight I was so loud I couldn’t hear if others were doing it. I had to tone it down to make sure they were doing it. The women who showed up first, the ones I had explained it to were participating, but the others weren’t. But that is ok, they will come around in their own time, in natural time. After class I felt awesome. Sounding is amazing. It is like a release and an energizer all at once. Have you ever been frustrated and just shouted, yelled, or screamed, you know how you feel after that? That sense of release, that feeling of “aaaaah, now I feel better.” Well, just think of an entire workout like that? It is exhilarating. A Nia Education article says, “every cell in your body is a sound resonator that responds to sounds coming from the outside and the inside of your body, and that all of the systems in your body – your physical, mental, emotional, and spiritual states of consciousness – respond to sound?”** Yeah, I knew that . . . . If you are interested in the article, let me know. It is very short and I can send it to you. 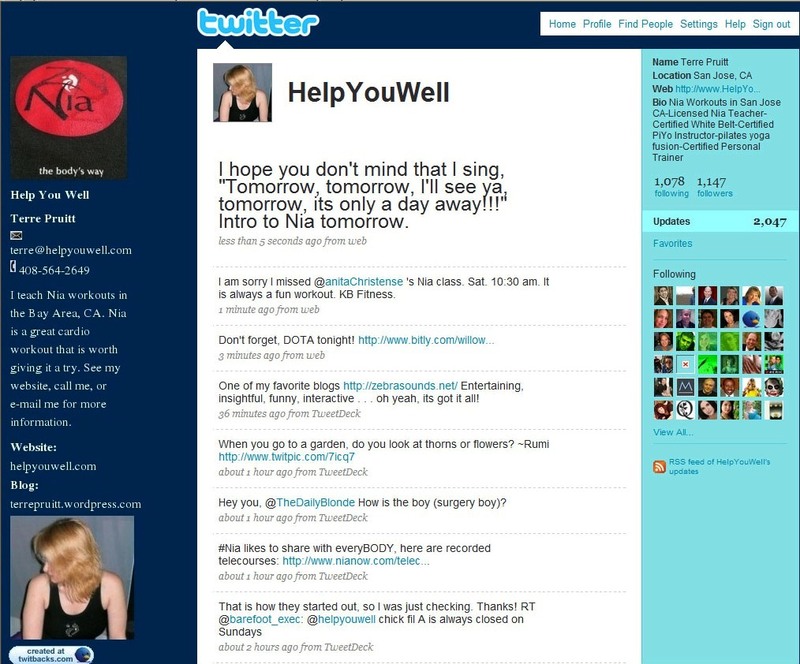 I have posted the tips for helping you begin sounding on my site, in case you are interested. So, can you do it? Are you ready to make some noise? **Nia Education ©2006 Nia Technique, Inc. I am not a Twitter expert. But . . . I have picked up a few things from a lot of people who could be considered experts. Plus I have picked up some things from just doing it. Recently I have connected with a bunch of wonderful people who have less time than I do to spend learning about this. So, I am going to share a few things that I have learned so that I can just point them at this blog instead of typing it all out individually (on my iPhone, mind you). Now, here is the catch, this is my opinion and my perception of how it works. If you have a different opinion or you know that it works differently please kindly share. That would be very appreciated and helpful. -Put a picture up. Anything, doesn’t have to be you if you don’t want, but don’t leave that twitter box up. That is not good. I actually have to be really convinced to follow people that have that (or I have to know them personally and understand that they just haven’t gotten around to putting a picture up). -Fill out your bio. Put something there. If you are Nia person, tell them about Nia, if you can’t think of anything else. If you have to, read OTHER people’s bios to get ideas. I have followed people just because their bio has made me laugh. Make up something funny. List your likes or dislikes, list what you will be tweeting about, share that you like to work out, share that you loathe exercise . . . .who cares what you write, just put something there. -Tweet. Oh my, this is the most difficult thing, but the most important. I am still challenged by it. But do it. If you are like me it is kind of intimidating. If you are following some major people (like I am, and I mean “major” as in they are “celebs” on Twitter) their useful information can make me wonder, “What do I have to add?” So I started by retweeting other people’s stuff. Then people would retweet my tweets and start talking to me. And then I would think of something to share and bam . . . . so it goes. I still retweet a lot because there is a lot of good stuff out there that I like to share, but I also share my own stuff. I also like to tweet about stuff happening in the area of San Jose (Willow Glen) in which I teach classes. The following is easier said than done: don’t worry so much (I still do, sometimes, but I try not to). The people that you want following you are the ones that want to see what you have to say. Right? So say what you want and you will get people following you. People will come and people will go. That’s ok.
Ok, I will continue this on Tuesday because right now, my word counter is saying that I am way over my self-imposed word limit. Tuesday I will tell you what I understand about @, RT, and DM. And of course, if you don’t want to wait, I am sure you can find all of this information out there somewhere else. Even though the Adho Mukha Svanasana or in more familiar language, Downward-Facing Dog is often used as a resting pose or a transitional pose, you are working a lot of your body. It is a great pose for working your legs, back, shoulders and arms. More specifically your gastrocnemius (calves), hamstrings, retucs femoris (front of leg), gluteus maximus, latissimus dorsi, serratus anterior (muscles by the ribs), deltoids, and triceps. As with a lot of yoga asanas the “working” is either a lengthening and stretching or a strengthening or both. This asana also helps strengthen the hands. Recently I took a yoga class in Los Gatos and I am looking forward to going back because I realized something, I don’t like this pose that much. But what I have come to accept in my exercise workouts and Nia practice, is that if I don’t like something it is usually because I am not doing it correctly or it is something in which I need to improve. So the reason I am looking forward to my next class is because I hope to ask the instructor for a body check. If not in my next class I will ask the instructor in Willow Glen. I want an instructor to assist me in making sure I am doing it correctly. Then once I feel the correct way to do it, I will work on it. So, as you can see I am taking this Down Dog thing seriously. Just because it is thrown in as a way to get to the next move and sometimes treated like a rest, I still want to use it to help strengthen my back, shoulders, and arms. I want to work at it to make sure I am getting the full benefit of the lengthening of my legs and arms, and the stretching of back. Do you work your Downward-Facing Dog or just let it lie? In Nia (TM) our movement is for Joy. “Joy is not a technique or a choreographic method. It is an attitude toward the body and toward life. Joy is not just for when things in like are going well. It is an open accepting energy that accepts whatever comes its way.” (1) This is Universal Joy. So we choose during our workouts to sense Joy and to seek the Joy of Movement. Throughout our routine we seek to sustain that Universal Joy. If we are able, we actually increase it. When we lose it or if we are doing a move that causes it to faulter, we tweak. I think these can be applied to life. That is what I love about Nia. We have all these thoughts and ideas that we apply to our workouts, but they aren’t necessarily new and they can applied to life. When you are doing something that gives you joy don’t you want to keep doing it? When you have joy don’t you want to increase it? When you start to lose it don’t you do something to tweak it and bring it back? That is what we do throughout our work out. We are using our bodies to seek the sensation of Joy and if we find it and we can increase it, we do. If we start to lose it we can tweak it. Our workouts are about one’s own body and how it feels. So while you are following the teacher you are also paying close attention to yourself and making sure that you are sensing the Joy of Movement. This is one of the things that makes Nia such a different workout. We are actually “sustaining, increasing, and tweaking” the entire time. Universal Joy. Allowing our bodies to move for pure pleasure. Doesn’t that sound like something you want to do?